The practice of yoga provides strength, stability, a sense of balance and physical flexibility. All these skills are key benefits for improving your surfing abilities. Calm and steady breathing helps us to stay focused to do asanas awareness and attentiveness, giving us the perfect combination of physical strength and mental relaxation. 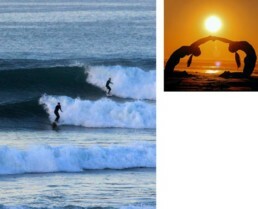 The yoga package can be combined with either surf coaching or surf guiding. We start our surf day with a tasty breakfast consisting of fresh fruits, coffee and tea, omelettes, Moroccan peanut butter and pancakes, made from a traditional family recipe. We aim to leave the camp at around 9 am to find the best beach breaks for you. During the first surf lesson, our instructors will explain key surfing theory, you will spend some time on the beach practicing the movements and then the instructors will join you in the water for about 2 hours during which you’ll have your first experience of trying to stand in the waves. When you get out of the water a fresh handmade lunch and fruits will be waiting for you giving you the energy you need for the afternoon session. The second session of the day is free surf, during which your surf instructor will analyze your technique in order to give effective feedback to you during the following day’s lesson. 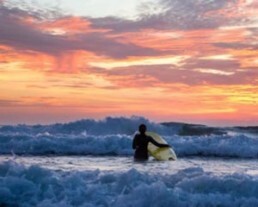 The time we leave the camp is dependent on the daily surf conditions. Our skilled and advanced surfers have the option to go to empty lineups before breakfast to catch some perfect waves, or to head to advanced surf spots separate from the beginners’ group. If the conditions allow we time the day around one big surf session, which may involve checking different spots. To keep your energy up so you can catch every perfect wave, a fresh packed lunch and fruits is brought to the surf spot each day. 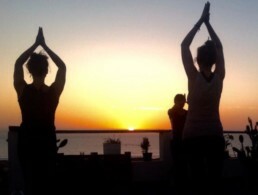 After a day of top-class surfing at the beach, we drive home to experience another highlight; a rooftop sunset yoga session. The perfect way to wind down and stretch aching muscles, our yoga instructors provide expertly designed yoga sequences that perfectly complement your surf experience. At 20.00 a delicious traditional dinner completes a perfect day at Pro Surf Morocco.